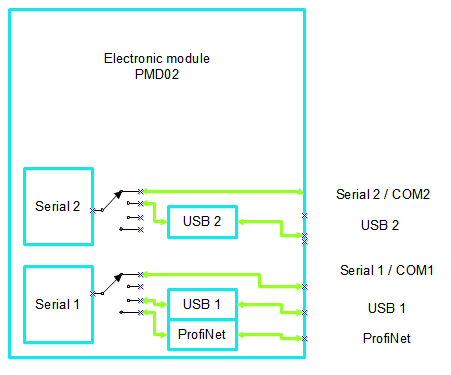 For the existing device family PMD02 are now more communication interfaces available as an option. This variant includes the Communication Interface Basic. In addition, there is The Possibility to communicate with a PLC or a computer to select a PROFINET interface in the SDI options. For this interface a Profinet module is integrated into the device. All interfaces are in addition to the standard interfaces on the rear of the units available. A conversion of inventory devices is only Possible by Exchanging the complete electronics module. In addition to the integrated interfaces is therefore to external ProfiNet module available. This is simply connected to the serial port SERIAL 1. Then Carried about SDI Communication Connection to the PROFINET. This variant is Intended for conversion or retrofitting in existing systems.